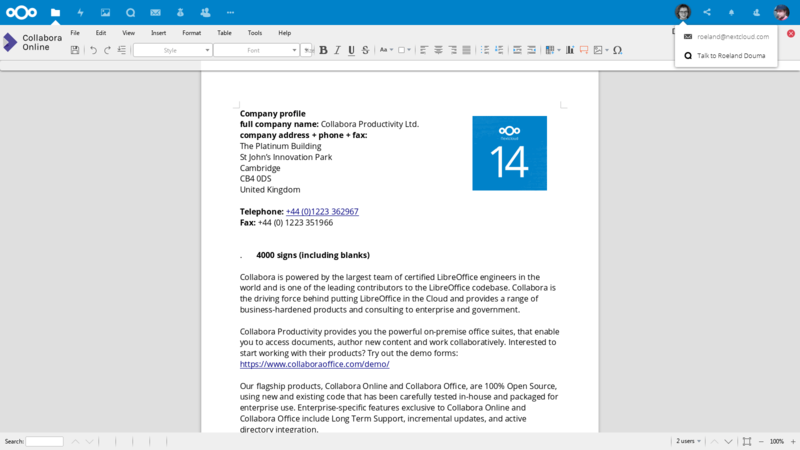 UK and Germany – October 18, 2018 – The Nextcloud and Collabora teams announce they have developed deeper integration, setting the stage for easier and more efficient browser-based collaboration for teams who need to create and share documents, spreadsheets, presentations and more. 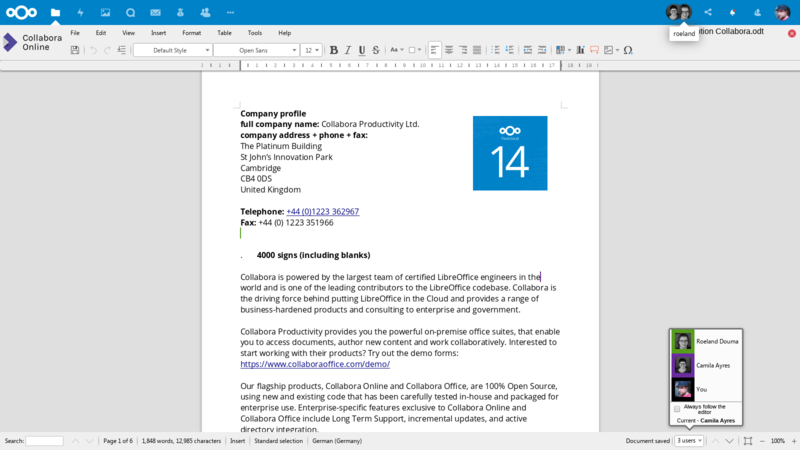 The improvements allow direct insertion of images from Nextcloud in documents, showing other people who are editing the file and integrating the Nextcloud file sidebar with Collabora Online. The sidebar gives users access to the sharing settings, comments, earlier file versions, and the file activity overview. These improvements set the stage for further integration. With the ability to start a chat or video call or sent an email to any of the participants in the call, share documents in a publicly shared chat to make it available to all participants and more, organizational borders disappear. 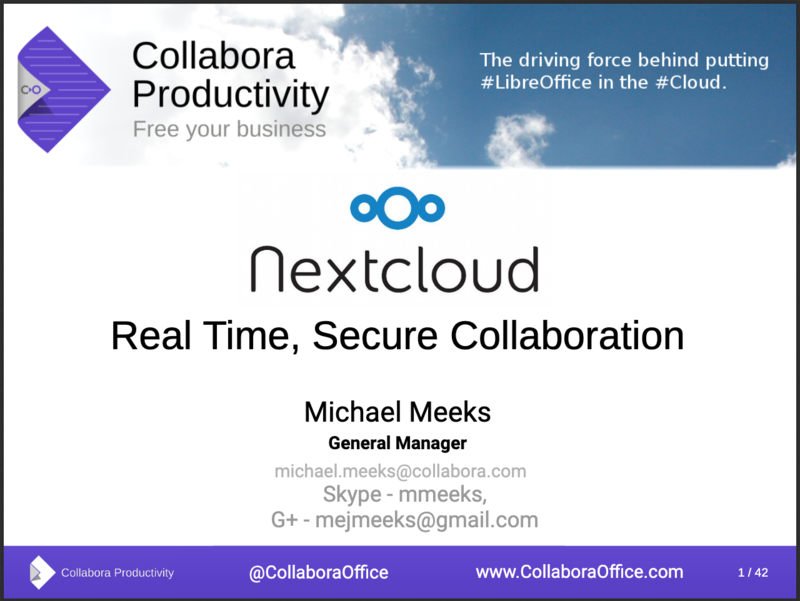 The changes are available right now in the app that can be downloaded from the Nextcloud app store, in combination with the latest release of Collabora Online. 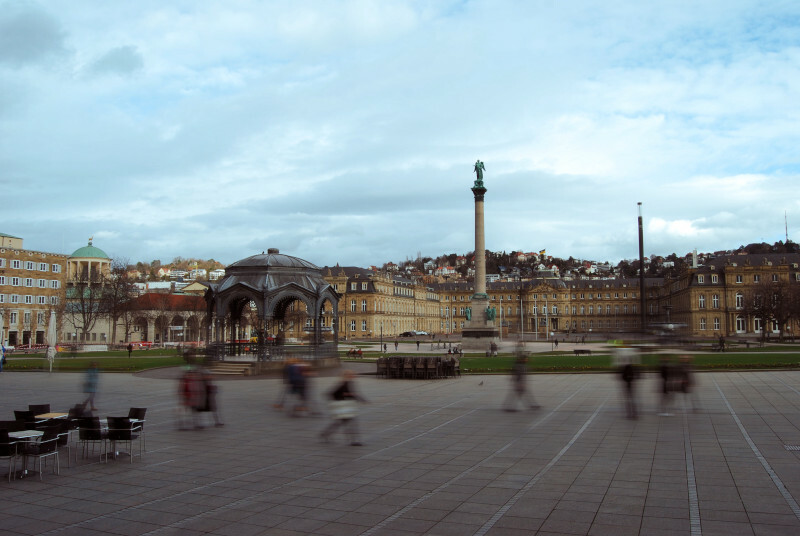 Further work is planned which will be reflected in future releases later this year. 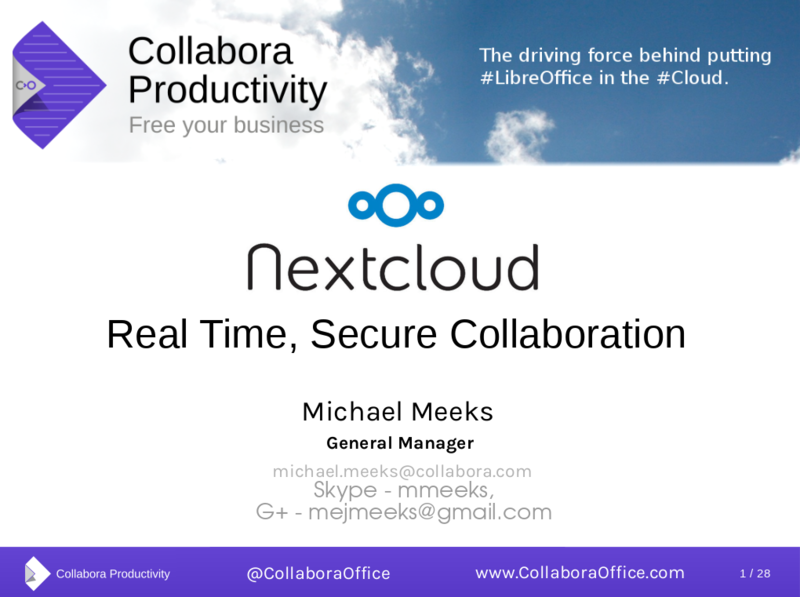 Nextcloud offers the industry-leading, fully open source, self-hosted Content Collaboration Platform, combining the easy user interface of consumer-grade cloud solutions with the security and compliance measures enterprises need. 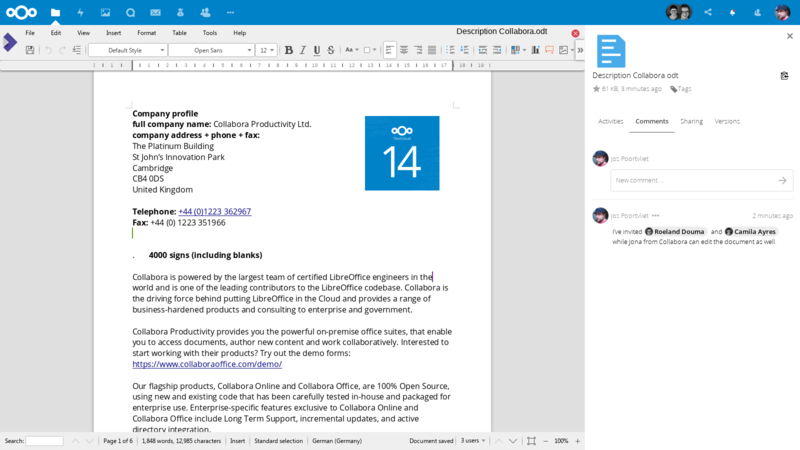 Nextcloud brings together universal access to data through mobile, desktop and web interfaces with next-generation, on-premise secure communication and collaboration features like real-time document editing, chat and video calls, putting them under direct control of IT and integrated with existing infrastructure. 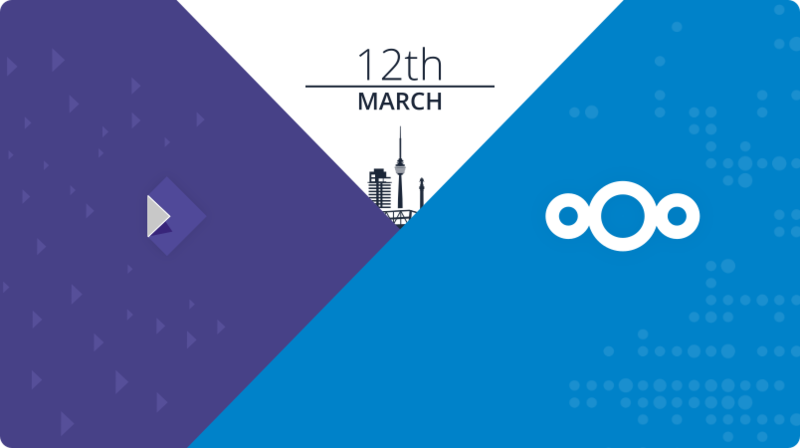 Nextcloud’s easy and quick deployment, open, modular architecture and emphasis on security and advanced federation capabilities enable modern enterprises to leverage their existing file storage assets within and across the borders of their organization. 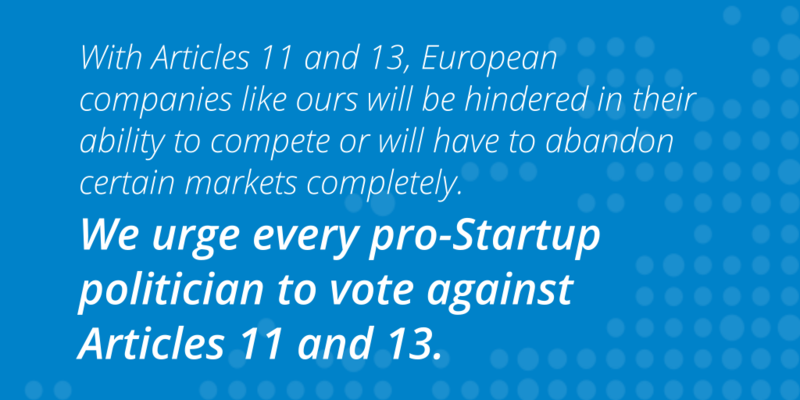 For more information, visit https://nextcloud.com or follow @Nextclouders on Twitter. 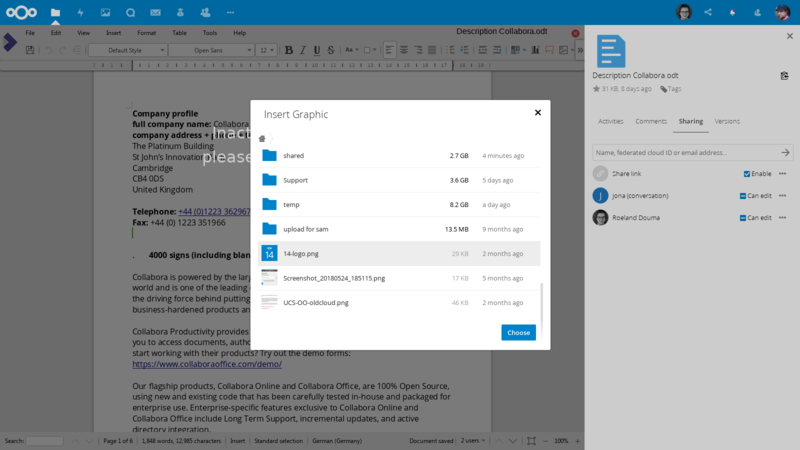 Inserting an image that is stored on Nextcloud into the document. Users can now click the share icon in the top bar and get the sharing side bar. The sharing sidebar also allows commenting on files, viewing older versions and the file activities. Two users are collaborating with the file owner. Nextcloud allows users to click each users’ avatar to immediately contact them.